We are a rural, college town, that is located in the scenic Cumberland Valley of South Central Pennsylvania, directly on the line between Franklin and Cumberland counties. With the nearby Pennsylvania Turnpike and I-81, it is just a short driving distance from many metropolitan centers, including Philadelphia, Pittsburgh, Baltimore, Washington D.C., and New York City. 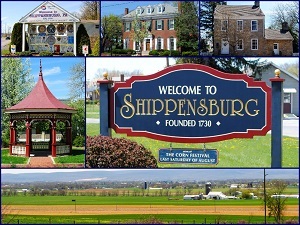 Craft festivals, downtown festivals, SHAPE Art Gallery, The H. Ric Luhrs Performing Arts Center The Thought Lot, Shippensburg Historical Society and Shippensburg Station (railroad museum). Walk-In/Urgent Care Center facility. Approximately 20 min. drive to hospitals in Chambersburg and Carlisle, PA and approximately 45 min. drive to facilities in Hagerstown, MD and approx. 45-60 min. drive to Harrisburg, PA facilities. Jan 22.0 F° 29.5 F° 37.0 F° 2.9 "
Feb 24.0 F° 33.0 F° 42.0 F° 2.8 "
Mar 31.0 F° 41.0 F° 51.0 F° 3.6 "
Apr 41.0 F° 52.0 F° 63.0 F° 3.5 "
May 51.0 F° 62.0 F° 73.0 F° 4.0 "
Jun 60.0 F° 71.0 F° 82.0 F° 3.6 "
Jul 64.0 F° 75.0 F° 86.0 F° 3.9 "
Aug 62.0 F° 73.0 F° 84.0 F° 3.1 "
Sep 55.0 F° 65.5 F° 76.0 F° 3.8 "
Oct 43.0 F° 54.0 F° 65.0 F° 3.0 "
Nov 35.0 F° 44.0 F° 53.0 F° 3.2 "
Dec 26.0 F° 33.5 F° 41.0 F° 3.2 "
Spring temperatures are cool with averages in the low 50's and highs in the low 60's. Nights are cold with lows in the low 40's. Summer temperatures are mild with averages in the low 70's and highs in the low 80's. Nights are cool with lows in the low 60's. Fall temperatures are cool with averages in the mid 50's and highs in the mid 60's. Nights are cold with lows in the mid 40's. Winter temperatures are cold with averages in the low 30's and highs in the upper 30's. Nights are cold with lows in the low 20's. There are many non-profit organizations in Shippensburg with volunteer opportunities.